Every Tuesday Tammy hosts Kitchen Tip Tuesday. 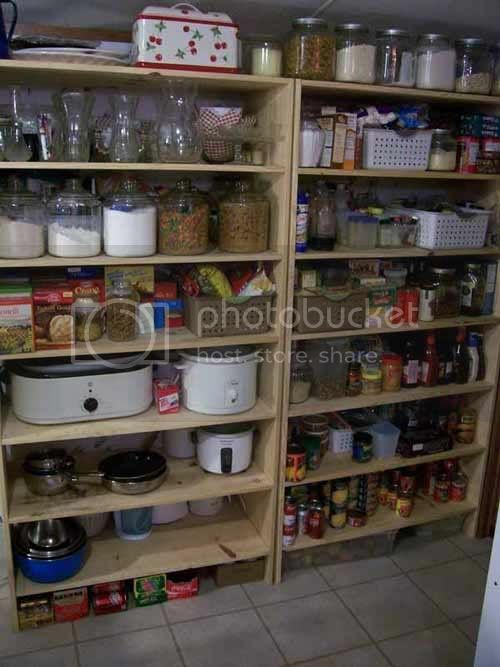 This week she is talking about her pantry and food storage. Since I don’t have Photoshop re-installed on my computer yet I am going to use photos I’ve already uploaded before. 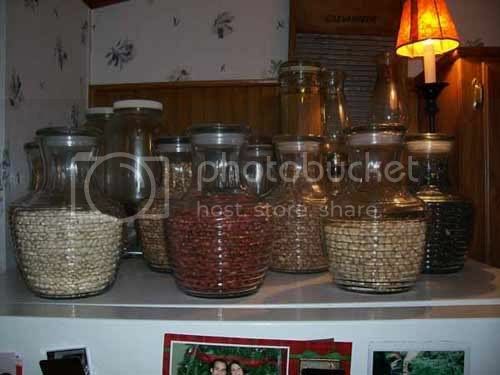 Today Tammy linked to a post she did in the past about using jars for storage, which I also do. We live in a mobile home, so my kitchen is rather small. I wanted to be able to store food, but do so in an attractive way, since it is out in the open. I hope that what I have done, will spark some ideas about how to organize your kitchen. In January I did a post on my small kitchen, if you would like the full tour, feel free to stop by that post. This is the top of my refrigerator. The beans are actually stored in juice decanters that I found at Wal-Mart. Lindsay and I were looking for unusual jars, and saw these. They are great for the beans and have an airtight seal. This is the pantry that Gene built me. In the jars on the top shelf I have egg noodles, oatmeal, instant potatoes, brown sugar, & pancake mix all stored in cracker jars. 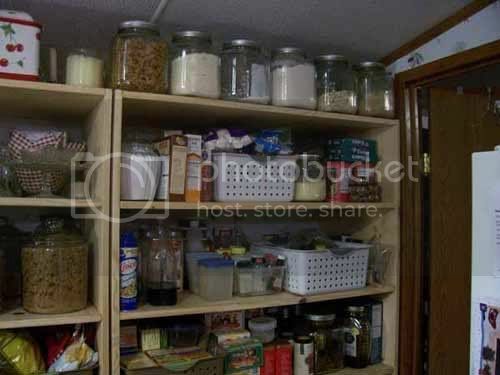 I also have a few items stored behind the jars such as extra boxes of powdered milk. On the lower shelves you will see jars with powdered sugar, & cornmeal. These jars hold my unbleached flour, prairie gold flour, sugar, and two of them hold cereal. I love these jars because of the wide mouths and the ease of use when baking. I was forever spilling sugar, and flour all over the place when trying to get it out of jars with smaller openings. The small openings also caused me to have to use a very small cup to scoop, which made it take much longer to measure out the big batches I make. 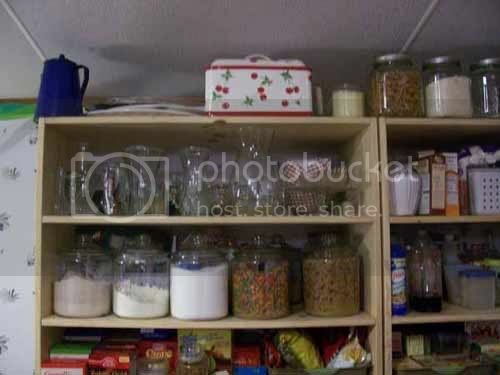 This is a shot of the whole pantry. A lot of people wouldn’t like it because it’s open, but I have found it helps me to keep things more organized. I considered hanging curtains on it, but felt they would be always getting in the way. I don’t mind the kitchen looking like a work center, because that’s what it is. I have come to realize that my kitchen is many things. It is the heart of our home, a place we work together, play together, laugh, joke and sometimes cry. It is a place where memories are made. While I want it to be practical and functional, I also want it to look welcoming and cozy. Well, I’m off to organize my kitchen cabinets. I am going to be doing some de-cluttering and re-organizing of my cabinets this week.